Feng shui practitioners use baguas as road maps or blueprints to identify specific sectors in homes, apartments and offices. You can use the bagua overlay for your whole house, apartment, office or individual rooms. In Classical Feng Shui, the bagua is used once you have taken a compass reading to determine the facing direction of your home, office or apartment. You will need to find the center of your home to place it correctly on the layout of your home. 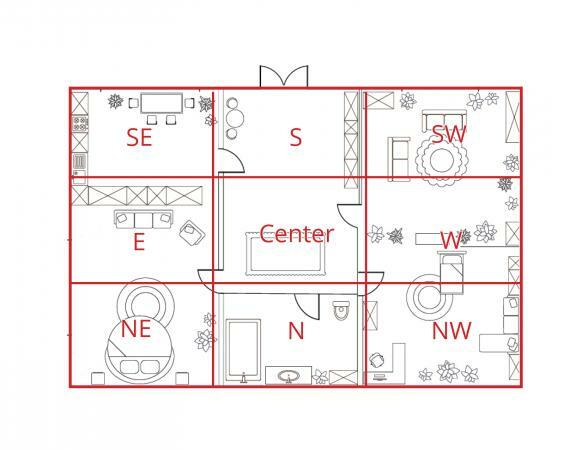 You'll need a layout of your home, apartment or office (you can draw it) and a few drawing tools. Once you have the necessary materials, you can apply the bagua to your home layout. You can find the center of your home, office or apartment using a simple geometric method. Once you have completed this process, you will proceed to creating the bagua on your layout. 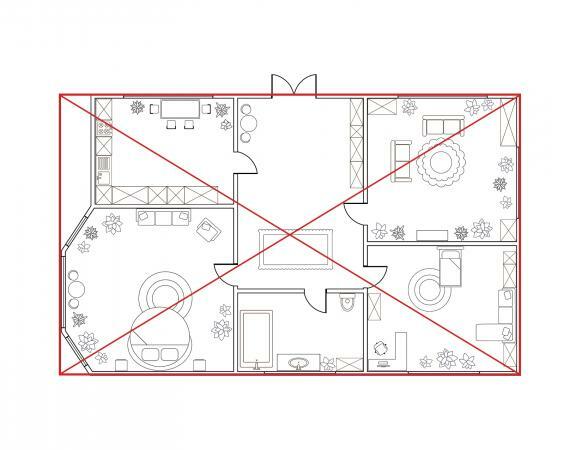 Draw a rough layout of your home. If it isn't a square or rectangle, you can draw an imaginary line to extend missing corners to create a complete shape. 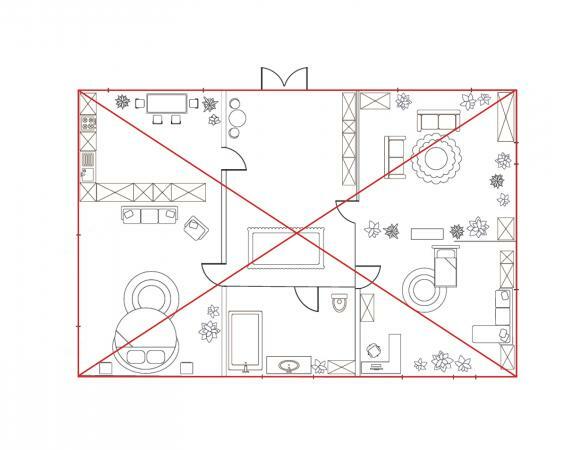 Use a ruler or other straight edge and draw a line from one corner of your home layout to the one diagonally opposite. Draw a second line from the other diagonally opposite corners. This will create an X. The center of your home is where these two lines intersect. The next portion of this process is easy and quick. You will the protractor to indicate the compass reading for the front of your home. office or apartment. To derive this location, you will draw a straight vertical line through the intersection of the diagonal lines. You need to draw a vertical line through the center of the layout to indicate the compass direction from your reading. Measure the length of your house layout and divide by 2. This will give you the center of the length of the layout. For example, if the two long lines of your rectangular home are draw as 8"L then measure 4" from the outside of one end of the line and mar this point. Repeat on the other line. When you lay the ruler along these points, they should line up with the center X point. Draw a line connecting all three points. Now that you have drawn the X intersecting lines and the | vertical line, you can position your protractor to line up with the appropriate degrees. Find the compass degrees on the protractor and line it up with the vertical line. Using a pencil, mark point along the outside of the protractor. This is the exact facing direction of your home. You need to draw each sector of the bagua on your home. These will be wedges dictated by compass degrees for each of the eight compass directions. Use the following chart to find the range of degrees for each direction. To create each sector, use the above chart to find the number of degrees for that direction. This range is the complete compass direction sector. You need to indicate this on your drawing. For example, if your home is 123.5° SE (southeast) then the range is 112.5° to 157.5°. Mark this range by using your compass. Make the beginning and ending of this range. Make one mark to the left of the 123.5° for the beginning degree and another mark to the right at the ending degree. Draw a line from the mark on the left (112.5°) to the center point and a line from the left mark (157.5°). You have now created the SE wedge that indicates this sector on your home layout. Refer to the above Compass Degree Chart to complete the bagua wedges for the remainder of your layout. Using the same example of the first wedge you made, find the 202.5° line on the protractor and mark it along the outside of the protractor. Draw a line connect this point with the center point. This is the second wedge and indicates the south sector. Proceed to the next degree 247.5° and move through the degrees, drawing each wedge until the eight bagua wedges are completed. You can indicate each direction with abbreviations, such as SE, S, SW, W and so on. Now that you have a precise layout of the bagua over your home, you can begin to apply feng shui principles to your home. Use the bagua sectors to activate their governing elements. Some of your rooms may fall in more than one sector. Pay close attention to the corner(s) of more than one sector in the room and use the appropriate element in that corner only to avoid conflict elements. You can use feng shui guidelines for each sector to decorate and select symbols and cures. 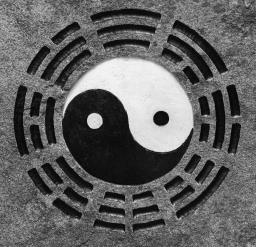 Compared to Classical Feng Shui bagua applications, Western Feng Shui known as Black Hat Sect (BTB) is easier. In BTB, the bagua is transformed into a grid or map using the nine magic squares for a hybrid form of feng shui. You will want to create a layout of your home, just as you did for Classical Feng Shui. Instead of using the compass to determine the facing direction, BTB tossing out the actual compass direction. BTB adopted the bagua and transformed it into a cookie-cutter approach by placing the bagua map the same way for every home or office, regardless the actual compass direction. You can print a bagua map and then place it over your layout. In BTB, the south direction is always aligned with the top of your layout, opposite the front of your home. North is always lined up with the front of our home. Place the nine-square grid bagua over your home layout. Determine the individual sectors of your home based on this form of feng shui. You can now apply elements and other feng shui cures and remedies as needed. 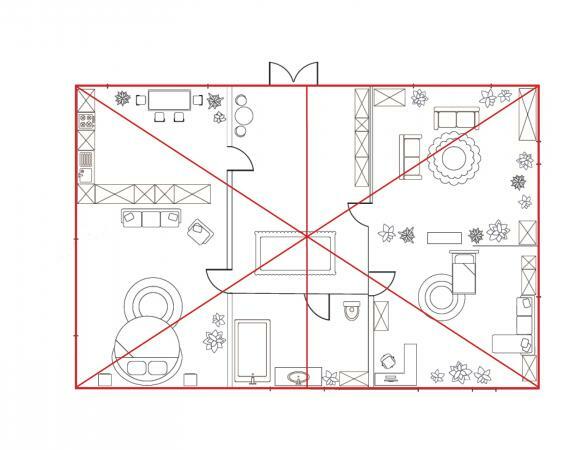 If you wish to micro-size the bagua to use in individual rooms, you can follow the same instructions and instead of using a whole house layout, you will work with a large drawing of the room. This technique can help you better define compass directions within a room or in the case of BTB, apply this type of feng shui per room. In the first concept of the bagua, Early Heaven Bagua was created to reflect a perfect universe. This was a creation that was in perfect balance and harmony. The Early Heaven Bagua was later considered yin. To balance this, the Later Heaven Bagua was created as the yang half. In practical bagua application, the formulas used in feng shui, such as flying stars, pillars of destiny and others were developed during the Early Heaven Bagua creation while the Later Heaven theories were created to apply those formulas. 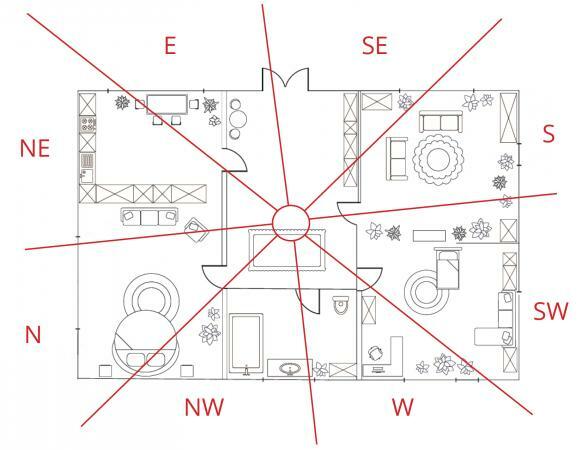 Depending on the school of feng shui you practice, you can apply the bagua to your home layout. Once you identify where each sector is on your layout, you can begin applying feng shui practices and principles to your home decor.